Well folks. In January I went into meltdown (almost) trying to get totally unexpected zoea to land. I actually managed to get 6 to land but they failed to survive their last moult. I am being given another chance now. 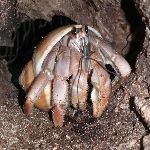 I checked on my crabs just before going to bed last night (Sat 3rd Dec 2016) and noticed Mango up on top of the salt pool for about the 4th time that evening. I was a little suspicious of this behaviour. We had a stinking hot day on Saturday and in the evening a huge thunder storm. I went to check on crabs at 1130am Sunday morning and noticed zoea in the salt pool. Took me a while to sort out my stuff from last attempt and get things set up but at about 1630 I transfered the water with zoea from the tat into my make shift Kreisel jars. This is again a foam esky water bath with fish tank heater warming tap water to 30c... a jar in this bath with ocean salt water and the zoea in it. 2 airstones to get good circulation. 4 I am ready to document this attempt way way better than last one. Wish me good luck folks. Last edited by Renroc on Thu Jan 19, 2017 9:48 am, edited 2 times in total. I just woke up and this is exciting, can't wait for pictures! Prayers, blessings and crossed fingers! Last edited by Renroc on Sat Jan 21, 2017 11:20 pm, edited 1 time in total. How exciting Renroc! Try not to be hard on yourself! You are doing the best you can! I'm praying for you! Hang in there! Ohh, how exciting! I look forward to all future updates, hopefully things go well for you! Weather It is going to be a really hot day again. Checked at 0730 and all seems good except the water is only at 24c so maybe the heater isn’t working. The light is on though so there is no way to test it. Took out some water and added some hot water to bring the temp up. Bought a new 55w heater before swimming. Dashed in at 11 to throw it in the water bath which was still warm so maybe the other heater is working but needed longer to warm it up. Looked into the tat and noticed more zoea in the salt pool. It can’t be left overs as I tipped them into a jar and rinsed the pool. SO maybe another crab or the remainder of Mango’s brood laid today. 1415 Did a 50% water change in the first jar and then tipped the pool into a cylinder jar (from last time) and added a bit of water. These crabs are going to send me mad. sounds like things are going well congrats! YASSSSS. lol I am so excited for you! I'm definitely looking forward to all the updates and all 20 fingers and toes crossed for you!! This is exciting! I wish you the best of luck! Ok We are at the end of Day 4 on lot one and Day 3 for lot 2. Lot 1 seem to have a heap of debris in the water and I've had to do 2 water changes this afternoon and tonight. I am pretty certain they have got to Stage 2. Going to need to get some more salt water tomorrow. Have a Kreisel in the making. The pipe is cut and ready to be sealed into the tank to form the inner chamber. Then to work out air supply points to get good circulation. I think I may need 2 air tubes as the chamber is over 30cm long. Curlz are you here? Any suggestions from anyone who has built their own would be appreciated. Ginger who I have sexed as female in 2012 seems to be exhibiting signs of male by chasing the females. It was Ginger who I caught eating the female who (I think) deposited eggs last time. Ginger had spent overnight in iso the other night and seems to be a little less agro since then. Still very active though. Will need to get a closer look at the underside. May I ask what you are feeding them? I plan on attempting breeding when I'm an adult, so I've been recording what people are feeding, what kinds of tank they make, water conditions, etc. Very interesting! Thanks for the updates! I too would love to see pictures of your crabitat!